However, should you encounter any problems entering a part or receive an incorrect price, please let us know so we can make the needed changes. or your browser's File - Print command to print it out. Patience...it's 5 full printed pages!! Did you finally receive your Jensen Steam Engine off eBay?...and UH OH !!... it's missing a few parts! Or has it been passed down for generations and now the "kid" has grown up and you want to, "fire her up again! "...but, "Oh No!!... parts are missing or you need fuel. Good News!!... 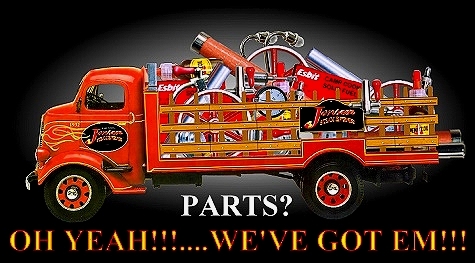 we still have parts available for most of our engines... even from the 1930's. Now you can place your parts orders, on line, using our secure server based shopping system. You asked for it and we're listening. Simply use the link provided above and select all the parts you need from our interactive parts list. We still offer our parts list in an easy to print web page format so that you can have a copy, all your own. Don't forget to indicate the Style number of your engine when it's asked for. You can then select only the parts you think you need. Then simply go through the check out process and send the Order right to Jensen, where we'll get your parts out to you.... pronto!! We hope this new addition will simplify things for all of our loyal fans, but espcially those from other countries, around the world, who've been so patient while struggling to get their parts orders processed, in the past. Hopefully we're making it all a bit more of a painless and enjoyable process.